Email is personal. With our team, email marketing can be, if you want to. With the help of automated and user-friendly features, your users get a great-looking email which makes them act, react and buy. As one of the best best email marketing services in Delhi NCR, we give a boost to your business with our smart and effective email marketing services. 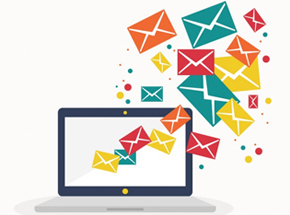 At NetJungle Media - Email Marketing In Delhi NCR, we take the most appealing features, sophisticated list management, attention-grabbing email templates, detailed reports and dazzling email or video email. Now, you can get everything at an affordable price. Sounds good? That's exactly what we do. There are 100 reasons-or probably more- than 150+ clients have hired us for their email marketing campaigns. With the help of exceptional feature set and headache-free tools, we have made all the campaigns successful and that too at a reasonable price. We are not just the email marketing service providers in Delhi NCR but we're a bunch of innovators. Conducting a quick research to understand your aims and objectives which helps us to determine what your campaign is exactly for. Create Gmail account to send and receive emails. Outlining the subject line of your email- concise and appealing language that’s neither too dull nor smart, and make your target users react. Our experts put the most compelling information at the top of the mail. We choose specialist email marketing software package, which helps us to send emails like web pages, including graphics. First impressions matter and therefore our experts make sure to choose the right message which appeals to your readers. Finally testing the emails to ensure it doesn’t get caught in the spam filters. Our email marketing team double check all the links in the email before sending it. We ensure the HTML and text based version are used properly.